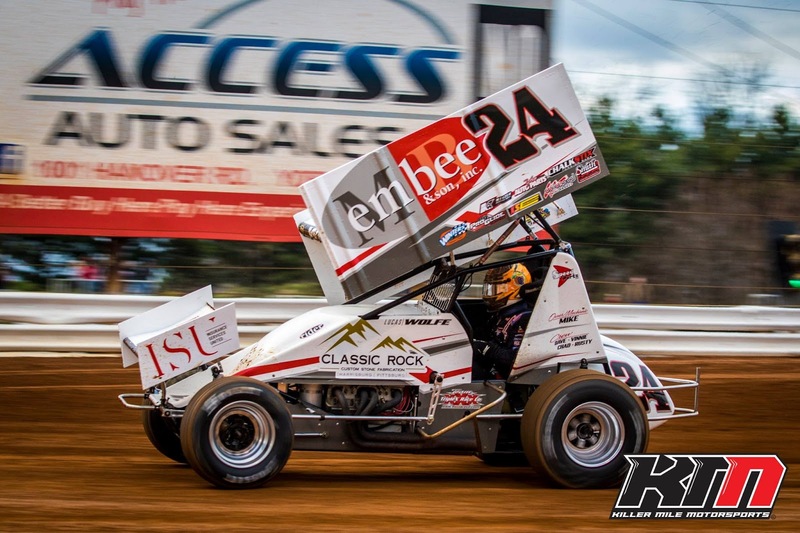 ABBOTTSTOWN, PA 4/15/2017 –Lucas Wolfe grabbed the lead at the outset from polesitter Greg Hodnett and led every lap to claim the $5,000 top prize in Saturday’s Leffler Energy Spring Championship for 410 sprint cars at Lincoln Speedway. Despite torrid racing in behind, none of the heavy hitters were able to catch the Michael Barshinger-owned Embee & Son #24 as Wolfe claimed his fourth career Lincoln win. Time trials, qualifying, and an inversion draw put Hodnett and Wolfe on the front row, with last week’s winner Gerard McIntyre, Jr. and Billy Dietrich on row two, and Danny Dietrich and five-time champ Brian Montieth on row three. Row four was just as impressive, with defending champ Alan Krimes and Chad Trout. Montieth was the hard charger through the mid stages of the race, getting around Danny Dietrich with six laps to go and closing on the winner in lapped traffic at the end. Third through fifth behind Wolfe and Montieth were Danny Dietrich, Hodnett, and Krimes. Sixth through tenth were McIntyre, 13th-starting Tyler Ross, Trout, Robbie Kendall, and 18th-starting Kyle Moody. Heats for the 410 Sprints were won by Montieth, Krimes, and Trout, with Freddie Rahmer winning the consolation after failing to qualify in his heat and missed the inversion. Fast time in time trials over the 28-car field was set by Freddie Rahmer with a one-lap time of 13.391-seconds (100.814 MPH). Like Wolfe, Jeff Halligan drove to his fourth career Lincoln win in the 20-lap “358” sprint car feature. The event included an 11-car melee in turn two of lap seven when Wyatt Hinkle and Adrian Shaffer made contact, sending Hinkle into a spin and collecting ten other cars. Shaffer was able to keep moving and was placed third for the restart. While he had his hands full over the remainder of the event with tenth-starting and defending champ Chandler Leiby, Halligan was busy trying to hold off the race-long challenges of early race leader Brent Shearer. Shearer started fourth and led the first two laps before Halligan claimed the lead on a lap three restart. Though Halligan led the rest of the way, Shearer wouldn’t go away, and crossed a close second. Third through fifth were Shaffer, Leiby, and Cody Fletcher. Sixth through tenth were 14th-starting Kyle Denmyer, Matt Findley, Ashley Cappetta, Todd Rittenhouse, Jr., and Steve Wilbur. Heats for the 26 358 Sprints were won by Shaffer, Phil Walter, and Halligan, with Trey Hivner winning the consolation. Next Saturday, April 22nd, Lincoln Speedway will hold a 3-division show featuring the 410 Sprints, 358 sprints, and Central PA Legends at 7 PM. Gates open at 5 PM. Time Trials Results – 1. 51-Freddie Rahmer, 13.391 (100.814 MPH); 2. 8-Billy Dietrich, 13.415; 3. 16-Gerard McIntyre, Jr., 13.445; 4. 24-Lucas Wolfe, 13.452; 5. 27-Greg Hodnett, 13.459; 6. 48-Danny Dietrich, 13.484; 7. 21-Brian Montieth, 13.492; 8. 87-Alan Krimes, 13.526; 9. 1X-Chad Trout, 13.561; 10. 2W-Glenndon Forsythe, 13.624; 11. 55K-Robbie Kendall, 13.645; 12. 59-Jim Siegel, 13.657; 13. 35-Steve Owings, 13.681; 14. 5-Tyler Ross, 13.760; 15. 88-Brandon Rahmer, 13.814; 16. 69-Tim Glatfelter, 13.819; 17. 5G-Chase Dietz, 13.838; 18. 39-Cory Haas, 13.845; 19. 39M-Anthony Macri, 13.883; 20. 21T-Scott Fisher, 13.898; 21. 7K-Dan Shetler, 13.926; 22. 99M-Kyle Moody, 13.926; 23. 14-Coleman Gulik, 13.991; 24. 44-Trey Starks, 14.018; 25. 6K-Chris Knopp, 14.246; 26. 27G-Jay Galloway, 14.563; 27. 10-Zach Eucalano, 14.573; 28. 16C-Matt Campbell, NT.